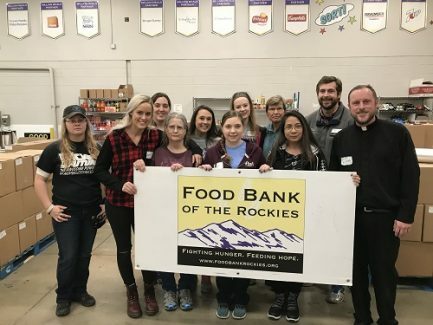 While many students enjoyed their last moments of winter break at home and faculty members returned to campus for the spring semester, Newman University Chaplain Father John Fogliasso accompanied a group of seven students to brave the frigid air of Denver for the annual campus ministry winter service trip. The focus of the service trip is different each year. 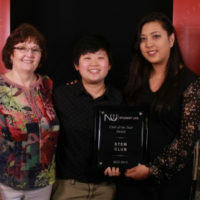 Past student groups have worked with immigrant populations in San Benito, Texas, as well as low-income families and single mothers in Santa Fe, New Mexico. This year the group’s focus was feeding the hungry. The eight-person group departed for the trip Jan. 7. During their time in Colorado, the group performed service at a food bank, a soup kitchen and a Habitat for Humanity Restore. The group poses for a photo in an area that overlooks the landscape of Denver. After exiting a restaurant, it didn’t take long for Fogliasso to lose sight of his group by about half a block, he said. But while scanning the crowd for familiar faces, he couldn’t help but notice a man standing on the corner of the street. “I got in a conversation with this gentleman, and as it turns out, he was homeless,” Fogliasso said. “He was telling me his story about being a supervisor at a plant in New York City. After that job, he traveled to the South and recalled doing service trips himself. He told me he never expected to be the recipient of service. 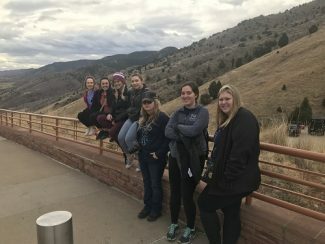 While a service trip may not initially sound to be jam-packed with fun, Fogliasso said there were several recreational activities in addition to the service projects. 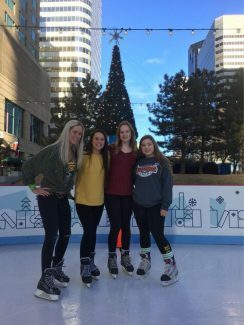 (l to r) Rooslana Rusk, Angela de Souza, Ellen Kurzweil, and Kailyn Eischen sport their ice skates at an outdoor skating rink. The group visited local landmarks including the Cathedral, the Basilica, the Mother Cabrini Shrine and the Red Rock Amphitheater. They also visited an outdoor skating rink as well as the United States Mint, where billions of coins are produced each year. Mass was offered each day for those who wanted to participate, but attendance was not a requirement, Fogliasso said. Senior Peggy Frazier said that one of her favorite parts of the trip was working at the food bank. 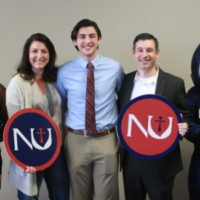 One aspect that set this trip apart from past ventures, Fogliasso said, was that Daniel Bryan, the Newman director of alumni relations and annual giving, was in the Denver area visiting alumni at the time. He, along with three other Newman alumni from the area, joined the rest of the group to help with the service project. 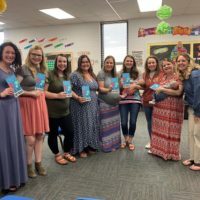 For those interested in learning more about next year’s winter service trip, please contact Administrative Assistant Monica Borger in the campus ministry office at (316) 942-4291, ext. 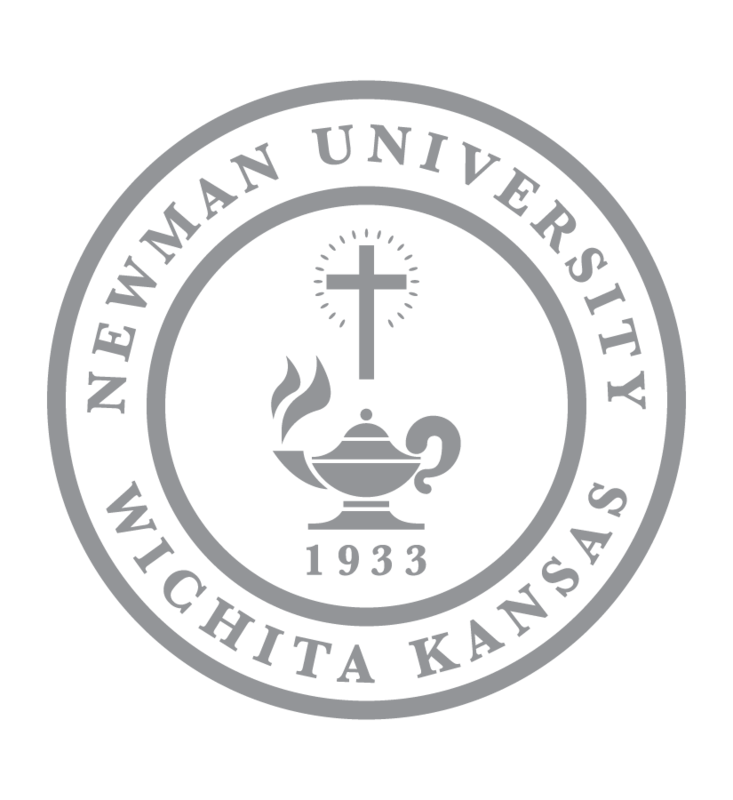 2422 or by email at borgerm@newmanu.edu.